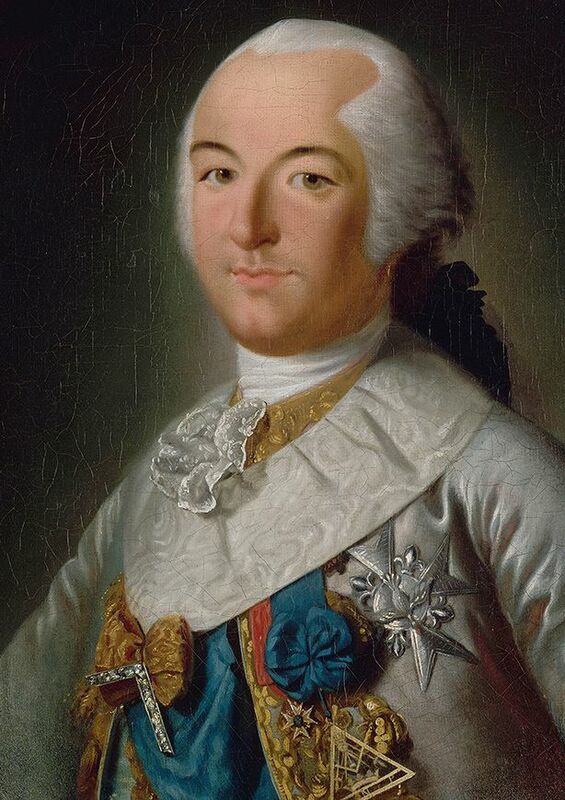 Louis Philippe II, Duke of Orléans, cousin of King Louis XVI, here pictured with the insignia of the grand master of the Grand Orient de France, the governing body of French freemasonry. During the French Revolution, he changed his name to Philippe Égalité. He actively supported the Revolution of 1789, and was a strong advocate for the elimination of the monarchy in favor of a constitutional monarchy. He voted for the death of King Louis XVI. Near the Pavilion of Marsan is the Palais Royal, that headquarters of insurrection, with its cafés, its gambling-dens, its houses of ill-fame, its wooden galleries which are known as the camp of the Tartars. 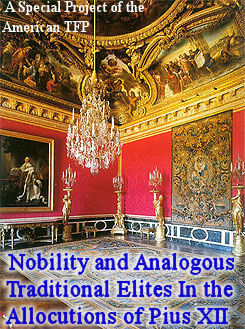 It is the Duke of Orleans who has democratized the Palais Royal. In spite of the sarcasms of the aristocracy and the lawsuits of neighboring proprietors, he has destroyed the fine gardens bounded by the rue de Richelieu, the rue des Petit-Champs, and the rue des Bons-Enfants. 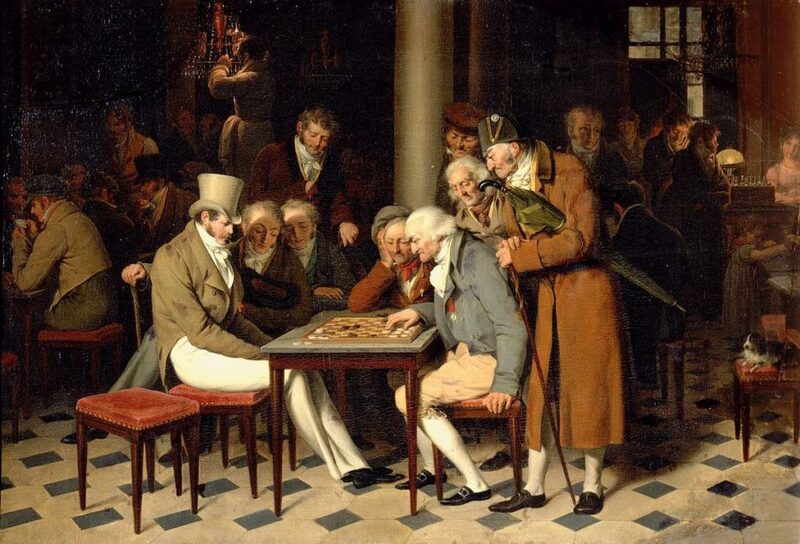 The Lamblin café at the Palais-Royal, one of the many places that were open for gambling and other vices. In the place it occupied he has caused the rue de Valois, the rue de Beaujolais, and the rue de Montpensier to be opened, all of them inhabited by a revolutionary population. The remaining space he has surrounded on three sides with constructions pierced by galleries, where he has built the shops that form the finest bazaar in Europe. 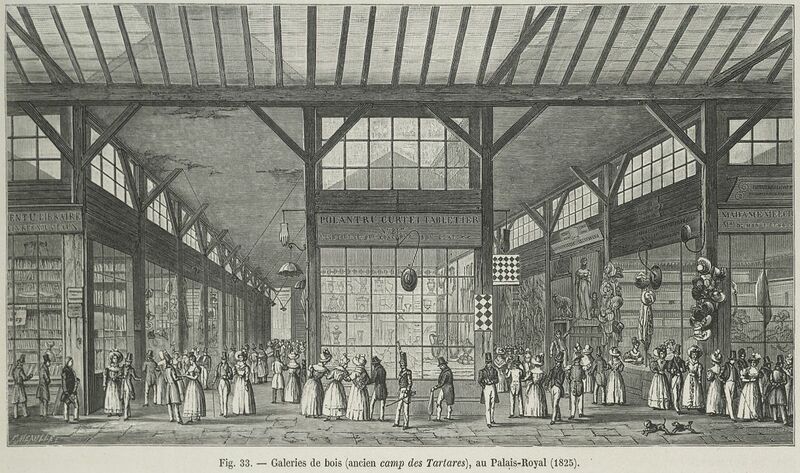 The Galeries of the Palais Royal were extremely popular, where Parisians visited the arcades at all hours in search of entertainment. Remaining open until 2 in the morning, the Galeries featured circus-like attractions, in addition to 180 boutiques. 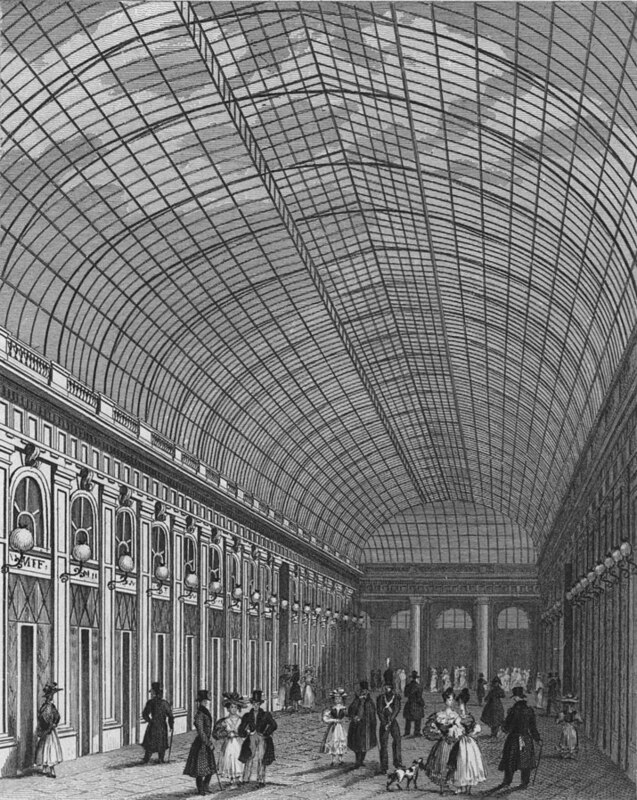 In an attempt to rid the garden of prostitutes and criminals, Louis-Philippe orchestrated the closing of a portion of the arcades in 1828, and opened the Galerie d’Orléans in 1830, with its cover consisting of a glass roof. The fourth side of these new constructions was originally intended to form part of the Prince’s palace, and to be composed of an open colonnade supporting suites of apartments. But this side has not been erected. In place of it the Duke of Orleans has run up some temporary wooden sheds, containing three rows of shops separated by two large passage-ways, the ground of which has not even been made level. 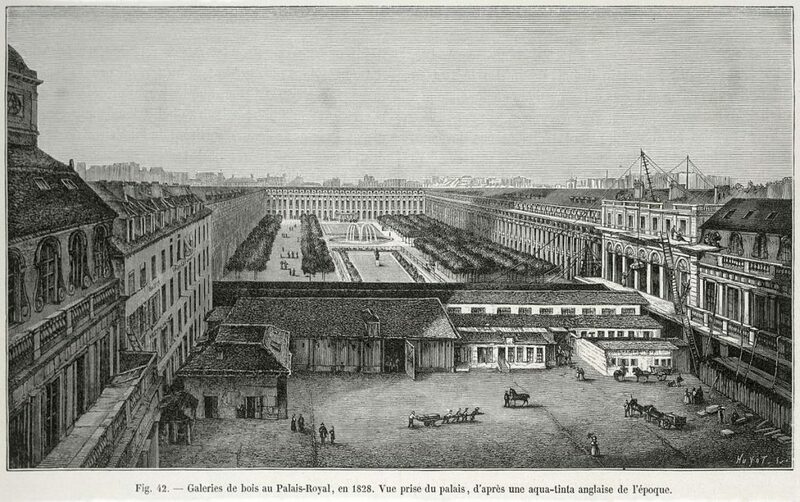 The Galeries de Bois were established in 1784 in the garden of the Palais-Royal, located in the first arrondissement. In addition to over one hundred boutiques, the Galeries featured circus-like attractions that served as entertainment to the visitors. The privileges pertaining to the Orleans family prevent the police from entering the enclosure of the Palais Royal. Hence it becomes the rendezvous of all conspirators. The taking of the Bastille was plotted there, and there the 20th of June and the 10th of August will yet be organized. Another view of the Galeries de Bois with it’s many shops.